The regional minister-designate for the newly created North East Region, Solomon Namliit Boar, told the Appointments Committee that negotiations are ongoing for a new cement factory to be built at Gbandaa in the Nalerigu Municipality of the region to exploit the huge deposit of limestone in the region to produce cement for the local and the international markets. According to the regional minister-designate, the region can boast of about 20 million cubic meters deposit of limestone. He stressed that the construction of the cement factory has been on the drawing board for some time now, stressing that when he assumes office he would facilitate the process with the Ministry of Trade and Industry so that the factory processes limestone to produce cement to create jobs for the people of the region. 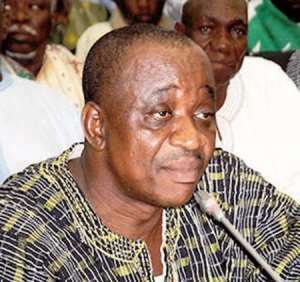 The minister-designate, who is also the Member of Parliament for Bunkpurugu, also said that the region has large tract of land for cultivation of rice especially in the Mamprugu Moaduri District of the region, as well as shea butter. He, therefore, called on investors to take advantage of the numerous investment opportunities to invest in the region. Mr. Boar said there is now absolute peace in the region and called on the people from the region to join hands to help promote the development of the region which he said is seriously lagging behind in terms of development. “We have our industrious youth and hardworking people who are yearning to support development of the region,” he said, stressing that the only problem that is facing the region is bad roads which are being urgently addressed under this government. “The president has assured us that roads in the region are going to be tackled as soon as possible to facilitate the development of the region,” he said, noting that work has started in the major towns of the region. He revealed that the region can also boast of cashew and cattle on large scale and expressed the hope that the people of the new region, who are excited about the creation of the region, will unite to ensure development. The regional minister-designate for the Bono East Region, Kofi Amoakohene, on his part, said he will use his influence as an astute businessman to encourage private businessmen to invest in the region, stressing that the new region has a lot of investment opportunities. He told the committee that farmers in the region, who are into the cultivation of cashew and mango, would be assisted to expand their farms. Mr Amoakohene disclosed that he would also ensure that the cash crops are processed to add value to them. He also told the committee that as the chairman of the Regional Security Council, he would improve security in the region by tackling highway robberies and armed robberies in the eastern corridors of the region. The regional minister-designate for the Western Region, Kwabena Okyere Darko-Mensah, also mentioned that security in the region would be improved due to the influx of people from the nation and West African sub-region to the region because of the oil business so that everybody would freely go about his or her business. As at the time filing this report, the regional minister-designate for Western North Region, Kingsley Aboagye-Gyedu was being vetted by the committee.